A few years ago, it seemed a new System-On-Chip (SoC) design using an ARM-based architecture would pop up every other week. While competition can be great, with so many of the designs offering similar core features and the need to provide support for the products, over time the major players in the ARM SoC market have shifted and consolidated (e.g. Texas Instruments has exited the Application Processor space). There are still plenty of companies that ship SoCs, but some of these are lower end offerings that can't really compete except on price, leaving us with a few major players. Depending on whom you wish to include/exclude, there are anywhere from four to eight SoC manufacturers still in the game, with three of them mostly catering to the budget sector. We could also include ARM as a company, but since they don't really manufacture any parts we'll leave that for a separate article. Before we get to the manufacturers, let's quickly go over the pertinent items to know for any SoC. The main functionality of any SoC is going to come from the CPU cores, where modern designs typically use either two or four cores, with some offerings including up to eight cores -- four lower power cores that offer better battery life with four higher performance cores for when there's work to be done. Next to the CPU cores in importance is the GPU, the graphics processor, and again you can find SoCs with multiple GPU "cores" combined to improve graphics performance (e.g. MP1 for one core, MP2 for two, and so on). Finally, it's useful to know the manufacturing process for an SoC, as lower numbers generally mean smaller, more power efficient chips. We've had variations of 28nm manufacturing for a few years now, with the state-of-the-art next generation SoCs now moving to 20nm for most companies. Ultimately, what it comes down to is the end user experience, which is a very broad topic and out of the scope of this article. The pace of technology in smartphones and tablets has been pretty brisk, however, so anything more than a year old can end up feeling quite sluggish, and after two years most users are ready for an upgrade. Most of the top SoCs right now are 28nm designs with at least two CPU cores, but not all cores are created equal, so this is another topic we'll address in a future piece. The general idea is that if you're like most people and live on the two-year upgrade cycle for smartphones, the best time to upgrade is usually right after a major technology advance. Roughly two years ago we started seeing the first ARM Cortex-A15 designs along with Apple's competing A6 "Swift" architecture, and while there are faster devices today the smartphones and tablets using those chips are still able to deliver a decent user experience. We're now on the brink of the next generation of SoCs, thanks to the shift to the 20nm manufacturing process along with ARM's new 64-bit Cortex-A53 and Cortex-A57 designs, so if you've been holding off upgrading the next few months should prove very enticing. Of course we'll still have to wait for early 2015 before many of the devices using the new SoCs are available for purchase. Without going into too much detail, here's the short list of significant SoC manufacturers, with a brief discussion of their current and upcoming parts. In the near future we'll have separate articles going into more detail on the various models and technology for each company, as well as some recommendations in terms of performance and the overall user experience. This is intended as a short high-level overview of the companies to get us started. 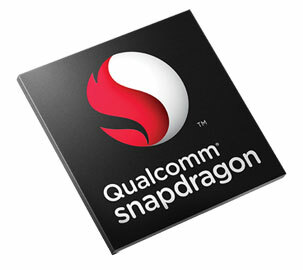 Qualcomm is one of the biggest players in the SoC market, and their designs are in many of the leading Android devices. All of the current Qualcomm SoCs are sold under the Snapdragon brand, and there are multiple performance segments (i.e. the Snapdragon 200, 400, 600, and 800 series). Qualcomm has had several custom-designed ARM architectures, with the latest being Krait (with multiple variations of Krait as well). Most of the lower tier parts are dual-core Krait designs with the higher-end 600 and 800 series being quad-core Krait offerings. Their current halo parts are in the 800 family, with the 800, 801, and 805 all presently shipping, but even within the same model number there are multiple configurations available (e.g. with or without cellular baseband options). The existing parts use either a 28nm LP or 28nm HPm process, but more recently Qualcomm has announced the Snapdragon 808 and 810, which move to a 20nm HPm process and use ARM's Cortex-A57/A53 64-bit cores in a 2+4/4+4 configuration, with Adreno 418/430 graphics. The shrink in process technology is something we should see from all of the major players in the coming months, with the benefits being potentially lower power and/or higher performance coupled with smaller chip sizes. In the near term, Qualcomm also has their new 410 and 610 Snapdragon parts that will be their first 64-bit SoCs. The 410 appears to be shipping in certain markets, and the 610 should show up in Q4'2014 devices. Meanwhile, the 810 should start shipping in devices in the first half of 2015 and will be the halo product from Qualcomm, with 808 following shortly after. Qualcomm has not yet announced a custom designed 64-bit architecture, but that will likely come later in 2015. Apple is next in the list, though really the top two positions are hotly contended and many would place them first. Either way, Apple needs little in the way of introduction. Largely responsible for the new paradigm in touchscreen smartphones thanks to their iPhone, the performance of Apple's devices has continued to increase at a rapid pace. Apple also has the advantage of running their own software with iOS, which potentially gives them an advantage over other companies that utilize Android. While earlier iPhones used designs largely built by other companies, Apple began designing their own ARMv7 architecture with the A6 in 2012. The latest generation A7 SoC was introduced about a year ago with the iPhone 5S in September 2013 and has since found its way into the iPad Mini Retina and iPad Air. 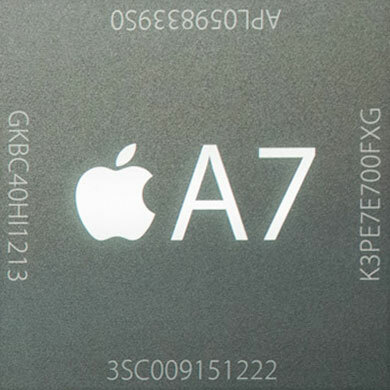 The A7 features a dual-core 1.3-1.4GHz Apple-designed processor codenamed Cyclone, running the ARMv8 instruction set, making it the first shipping 64-bit SoC. Short-term that may not be a huge deal, but long-term it paves the way for future devices. We believe the GPU in the A7 is a PowerVR G6430 200MHz GPU (four cluster MP4 configuration). The A7 is manufactured on Samsung's 28nm process and uses 1GB of memory. Given Apple's history, we can expect some sort of update at the next iPhone event, rumored to be on September 9. Most think the next Apple chip will be called the A8 and will likely move to a 20nm process technology, allowing for a generational leap in performance. We might finally see an iOS device with 2GB RAM. In terms of volume if not performance, Samsung comes next in our hierarchy, and they've long been a player in the SoC market, going back as far as the early 2000s with some of their chips; they were also the SoC provider for the original iPhone in 2007. Samsung has numerous smartphones and tablets available, and while many use Samsung SoCs there are also Qualcomm SoCs in some models. Their current SoC designs belong to the Exynos family, which has been around since 2011. The top performance Exynos SoC right now is the 5800, also called the Exynos 5 Octa, a 4+4 big.LITTLE implementation with four faster Cortex-A15 cores and four slower but more power efficient Cortex-A7 cores, paired with a Mali-T628 GPU. 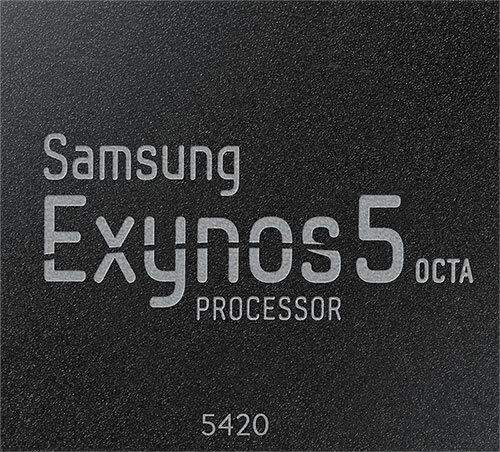 The Exynos 5 Octa (and Hexa if we include the 5260) use Samsung's 28nm HKMG process, but there's a new Exynos 5430 (used in certain models of the upcoming Samsung Galaxy Alpha) that has a similar configuration and uses a new 20nm HKMG process. We'll likely see more 20nm Samsung SoCs in the coming months, and with most companies shifting to the new 64-bit Cortex-A57/A53 we can expect Samsung to do the same. NVIDIA is a familiar name for PC enthusiasts, and they're sort of the reverse of Samsung right now: higher performance but lower volumes shipped. Given the growing popularity of tablets and smartphones, there's little surprise that NVIDIA is also working to gain (and maintain) a foothold in the mobile sector. Their latest SoC is the Tegra K1, found in the SHIELD Tablet and Acer's new Chromebook. 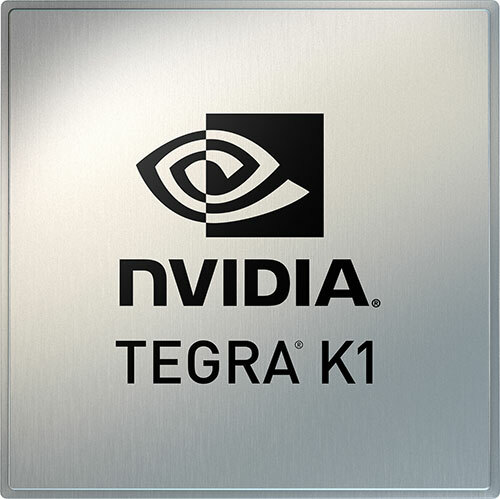 Tegra K1 pairs a 192-core Kepler-derived GPU with one of two CPU options. The first is a quad-core Cortex-A15 R3 design that's similar to the processor used in the Tegra 4, while an upcoming variant of the K1 will use a dual-core 64-bit Denver CPU designed by NVIDIA. Considering the most successful ARM SoCs are going the custom-logic route (e.g. Apple's Cyclone and Qualcomm's Krait are custom designs that use the ARMv8 and ARMv7 instruction sets rather than simply using Cortex-A15), NVIDIA hopes to improve performance while reducing power, among other things. While the shipping K1 uses four A15 cores and is manufactured on a 28nm process, the Denver version could move to 20nm, but NVIDIA hasn't officially announced the process for the Denver K1. The Tegra K1 is currently one of the fastest (if not the fastest) shipping SoCs, but many of the next generation SoCs have not yet launched so this could very well change in the next month or two. Looking forward, the successor to the Tegra K1 is currently codenamed Erista and is expected to pair a Maxwell-based GPU with Denver CPU cores, but that part won't begin production until some time in 2015 so it's a ways off. The final major player in terms of higher performance SoCs is Intel, another company that needs little introduction. Unlike everyone else on this list of SoC manufacturers, Intel is using their own custom architecture running the x86 instruction set instead of ARMv7 or ARMv8. Where x86 has proven to be a juggernaut in the PC space, in the mobile world where every device gets a customized software build it has not been nearly as useful – and some might even call it a handicap, though these days the difficulty of decoding x86 is relatively small. Intel has been trying to stake a claim in the mobile sector, and after a few initial forays that didn't accomplish much, their latest Atom SoCs have seen a moderate amount of use. The currently shipping Atom SoCs are 22nm devices, codenamed Bay Trail. You can find them in NAS and other products, but we're mostly concerned with the tablet and smartphone spaces for this overview. The Merrifield and Moorefield platforms (Atom Z34xx/Z35xx) remain at 22nm and use the same core Silvermont CPU cores as Bay Trail, except with PowerVR 6 G6400/G6430 graphics. Looking to the future, the platform that may finally give Intel a real leg up on the competition likely won't come out until early to mid 2015. 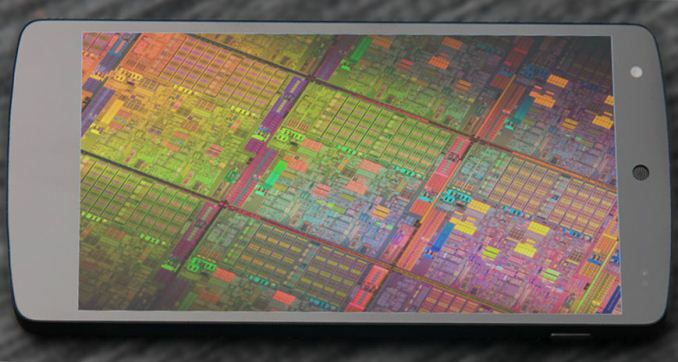 That's the Cherry Trail platform, which will upgrade the CPU cores to Airmont and move to Intel's 14nm process, delivering better performance in a lower power package. 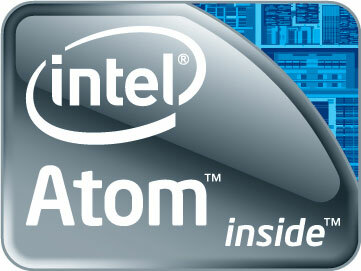 We've been saying "wait for the next Atom update" for a while, but on paper at least Cherry Trail looks very promising – it's the first Atom to ship on Intel's latest process technology without waiting a year or more, and it's the second Atom design after Intel's commitment to begin updating the Atom platform on a yearly basis. Moving over to the budget players, there are at least two that warrant mentioning. MediaTek has been around for a while now, though like most SoC companies they didn't really get into the ARM and Android space until 2009/2010. Starting in 2013, however, MediaTek managed a ton of design wins…but all of the wins are almost exclusively in lower performance, second tier parts. In terms of strict volume, MediaTek likely ships as many (or more) SoCs as the biggest companies, and they are a major provider of SoCs in the Chinese market. Not surprisingly, MediaTek devices tend to be budget friendly products, though that often means compromises in other areas as well. Their current top-tier SoCs use quad-core, hexa-core, and even octa-core Cortex-A7 designs with Mali-400/450 graphics (up to MP4 configurations). Like the PC world, however, throwing more cores on a chip can only get you so far, and the big.LITTLE configurations seem like a better solution than eight Cortex-A7 cores. MediaTek does have some higher performance SoCs with big.LITTLE A17/A7 starting to ship to device manufacturers (e.g. MT6595), though these are not yet in shipping devices. The MT6732 part has a quad-core Cortex-A53 CPU with Mali-T760 graphics, while MT6752/MT6795 move to octa-core A53 with Mali-T760/PowerVR G6200 graphics. The A53 is sort of the 64-bit equivalent of the A7 where the A57 is the higher performance 64-bit part, but A53 could end up delivering a nice blend of performance and efficiency. Allwinner Technology has many similarities to MediaTek. They've been around since 2007 but their earlier products were largely forgettable. In 2011 they became an official ARM licensee, and since then they've gained some popularity as a budget SoC provider. Their latest products include the quad-core Cortex-A7 based A33, which runs at up to 1.5GHz and includes a Mali 400 MP2 GPU. The A33 is marketed as "the first $4 quad-core tablet processor", and you will likely find this SoC in sub-$100 tablets; performance as you might expect largely follows pricing, but like MediaTek they can still do a huge volume thanks to their cost advantage. Their fastest announced product is the new A80 SoC, which features an octal-core big.LITTLE configurations (four Cortex-A7 and four Cortex-A15 cores) with a PowerVR G6230 GPU. It's currently shipping in China in the Onda V989, a $200 tablet with a 9.7" 2048x1536 display. As far as manufacturing processes go, the A33 uses 40nm while the A80 uses 28nm HPM. There are other SoC vendors we could mention as well. RockChip is right there with Allwinner and MediaTek vying for market share in budget products, for example. They even have the RK3288, a quad-core Cortex-A17 part with Mali-T764 GPU, which should provide decent performance, which is starting to ship in some markets. Let's also not forget their strategic agreement with Intel, which is interesting to say the least. We could also include AMD with their Mullins APU from the PUMA family, which like Intel uses an x86 CPU core designed in-house by AMD. AMD is also an ARM licensee, and they might look to bring alternative SoCs to market using ARM instructions sets instead of x86. The remaining players are small enough that it's difficult for them to compete with the bigger names. After all, if you're just licensing the same core architectures for the CPU and GPU as everyone else, you can't really offer better performance; all you can do is compete on price. Sometimes that's enough, but the real news in the SoC space is likely going to come from the companies doing their own custom logic. If we group all the companies shipping vanilla ARM designs under ARM (e.g. MediaTek, Allwinner, RockChip, and even Samsung), that still leaves us with Qualcomm, Apple, NVIDIA, and Intel doing custom logic. It's difficult to imagine any of those companies bowing out right now, and Samsung is a big player as well, which means we'll likely continue to see the "Big Five" SoC companies duking it out in the smartphone and tablet sectors. And while they continue nipping at the market share in the PC laptop/desktop space, they still have to worry about giving up ground to even more budget friendly devices from the likes of MediaTek and Allwinner. Actually, the top Mediatek processor shipping today in a phone is MT6592, an octal-core Cortex-A7 with Mali-450 MP4. And MT6595, a octal-core with for A17 + four A7 and a 2 clusters PowerVR 6200 seems just around the corner. Indeed, MediaTek is pushing huge volumes in Chinese market. They still have a lot to work before catching Qualcomm, as a SoC is a lot more than CPU and GPU alone, but they are unbeatable on price. Sorry -- somehow I missed the hexa and octa MediaTek options. They're still looking like Exynos levels of performance at best, which isn't the fastest chip around, and octa-core Cortex-A7 just seems... silly. There, I said it: I can't think of many use cases for eight of the same core in a smartphone or tablet. In fact, I think having two really good cores is still a better approach, though there are edge cases where quad-core can still prove useful.